So some of you know I picked her up from a reptile expo a couple weeks ago. 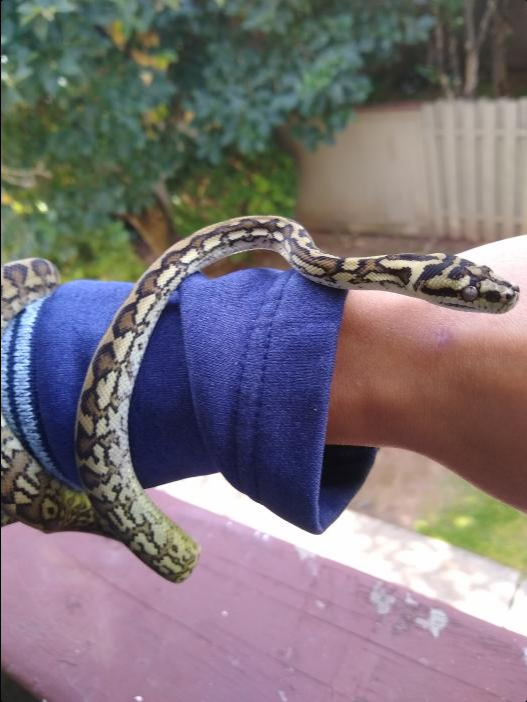 When I first got her, she of course was a nervous thing, defensive, trying to get away at the first opportunity, I even got tagged a couple times. She's a lot less nervous now. Seems comfortable. 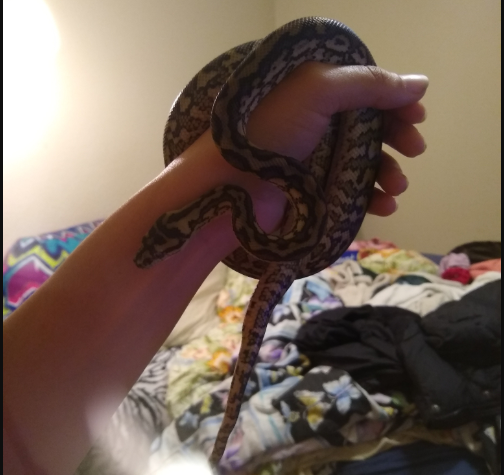 I'm more comfortable too now that I've gotten used to her movements, she is definitely much more active than a BP. 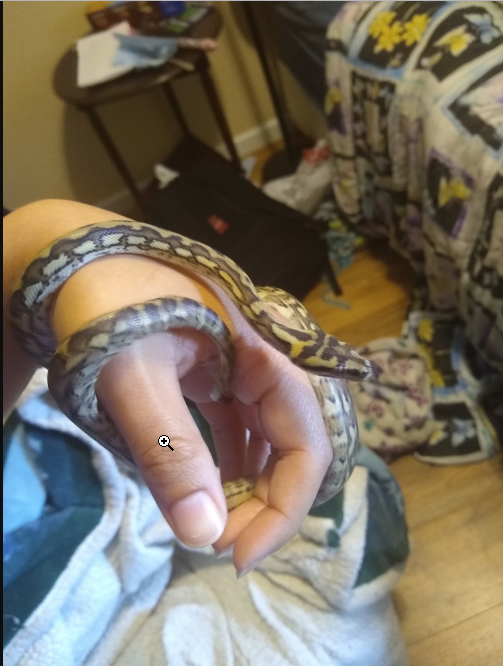 I see a lot of exploring and curiosity when she's on my hand, not a lot of fast moving or trying to get away. She's a good girl. I look forward to posting pics as she grows and progresses. 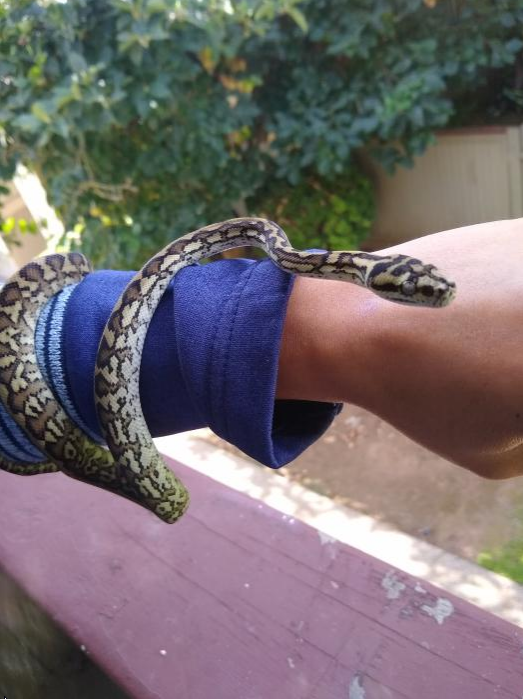 I mostly wanted to show a decent photo of her, and share my current success in getting her accustomed to being handled by me. Last edited by ClarinetPhoenix; 09-01-2018 at 05:45 PM. Great looking carpet. Sounds like she's settling in well with you. They're awesome snakes. I'm confident you'll love her even more as she grows. Last edited by EL-Ziggy; 09-01-2018 at 05:56 PM. I caught Mosaic about 3-4am this morning when I had woken up yet again(restless night) just completing her first shed with me. This is her fresh out of shed and looking mighty pretty! I am amazed at the transformation from her pre-shed colors, not to mention her browns are starting to lighten up now as she grows. I also don't think the photos do her justice. She's weighing in at 70 grams as well and she is thriving. Last edited by ClarinetPhoenix; 10-03-2018 at 03:21 PM. Congrats on your new pretty girl! She does look extra special after her shed. Oh man, she is absolutely stunning! GREAT pickup!! She looks amazing. Love the name as well. Congratz. Small update today, cause why not. My babygirl is getting big, well it seems big to me because when I got her she could fit in the palm of my tiny hands. She's on rat fuzzies now and getting ready to outgrow her little baby 18x18x24 glass tank I have for her. Unfortunately I just dropped money in Rei's new PVC AP T10 and I'm waiting for that to arrive. When that does come in I think I will move Mosaic into Rei's current 20gal long. Not ideal as its a glass tank, but I still need to pool together funds to get Mosaic her very own AP Cage in the near future. Last edited by ClarinetPhoenix; 12-19-2018 at 12:01 AM. She's looking good! Keep up the good work and good feeding. 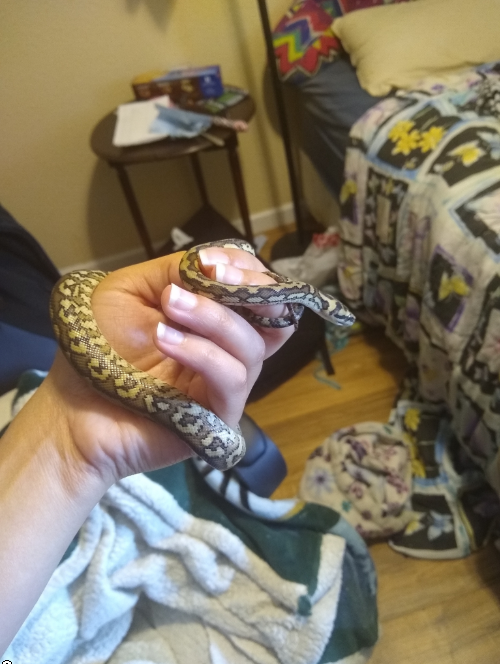 My little Bredli boy is 45g and so tiny, can't wait for him to grow more and be more relaxed when I handle him.